Figure 5. 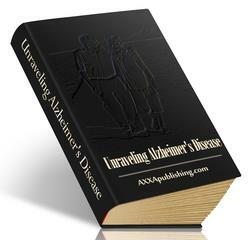 Alzheimer's disease. 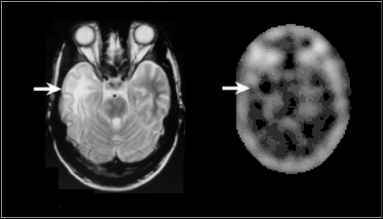 (A) SPECT brain perfusion in a patient presenting with dementia and moderate diffuse atrophy on CT scan. This single transaxial slice shows marked hypoperfusion bilaterally at the level of the parieto-occipital junctions (arrows). (B) 18F-FDG PET study (transaxial images) showing marked symmetrical glucose hypometabolism in the posterior parieto-temporal cortex (arrowheads). (Case provided by Dr. D. Worsely.) 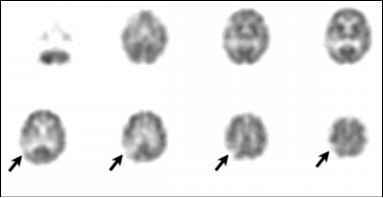 These scan patterns are typical of Alzheimer's disease. phenomenon which is stable over such a time frame, but is obviously a drawback for activation studies where it is often difficult to perform a given task for such a long time. Cerebral energy metabolism can also be assessed through measurements of molecular oxygen (O2) consumption. Oxygen (as 15O-O2) is administered by inhalation and measurement of its accumulation is used to determine the regional cerebral metabolic rate for oxygen (rCMRO2). This can aid in determining whether decreased rCBF results from a primary vascular problem (obstruction) or decreased metabolic demands (parenchymal dysfunction). By simultaneously measuring rCBF and rCMRO2 it is possible to obtain an oxygen extraction fraction (OEF). A normal OEF signals a match between needs and supply, and implies parenchymal hypoactivity; an increase indicates abnormally decreased perfusion with neural tissue attempting to extract more oxygen from a decreased supply. One day this approach may help select patients for a cerebral revascularisation procedure. Other metabolic studies can be performed with analogues of amino acids labelled with iodine-123 (SPECT), carbon-11 (PET) and fluorine-18 (PET). 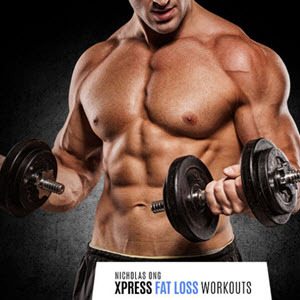 Most frequently these are derivatives of tyrosine, methionine and leucine. Usually used as markers of tumoral activity, these agents can also evaluate protein and neurotransmitter synthesis. Excellent results have been obtained in studying epilepsy and the dementias (where results are even better than with SPECT perfusion studies) with 18F-FDG PET imaging. It also can help guide biopsies, establish prognosis, evaluate recurrence of brain neoplasms, and differentiate residual masses from other conditions such as radiation necrosis (see section on Intracranial Mass Lesions). The high levels of cortical glycolysis normally observed can mask detection of low-grade brain tumors. Nuclear medicine is still the only means for studying neurotransmission directly and non-invasively in vivo. A broad array of SPECT and PET tracers are available, including neuroreceptor ligands (generally antagonists), neurotransmitter metabolic precursors, ligands of plasma membrane and synaptic vesicle transporters, substrates of neurotransmitter catabolising enzymes and components of intracellular transduction chains (Fig. 7). PET has long dominated this landscape, but over the past ten years progress in the field of radiopharmacy has contributed many SPECT tracers. Mathematical modeling of dynamic PET or SPECT acquisitions permits estimation of physiologically relevant parameters such as neuroreceptor densities for a large variety of chemically defined transmission systems, synthetic and catabolic enzymatic activities within those systems, numbers of neuronal terminals of a given nature, neurotransmitter concentrations in the synaptic cleft and even second messenger generation. Data acquired in these domains has revolutionised our understanding of neurologic and psychiatric diseases. While very few clinical applications are presently established for neurotransmitter studies, their potential for growth is probably the greatest in all of neuropsychiatric nuclear medicine. One suggested use is in the monitoring of therapy for psychoses. "Classical" neuroleptics, such as the phenothiazines, block the D2-subtype of the dopamine receptors. These receptors exist in high concentration in the striatum and are intimately involved in regulation of motor activity. Excessive blockade (beyond 80-85%) of striatal D2 dopamine receptors has been associated with an increased risk of developing long term side effects such as tardive dyskinesia. The level of D2 blockade can be measured with both PET and SPECT ligands, and patients found to have excessive blockade may benefit from a lower dose of medication or from an atypical neuroleptic with minimal affinity for D2 receptors. Predicting response to dopaminergic therapy in patients with a parkinsonian syndrome might also be possible. The striatal complement of D2 dopamine receptors is normal (or even increased through receptor up-regulation) in Parkinson's disease since the lesion resides in the nigro-striatal fibres (Fig. 8). In diseases such as progressive supranuclear palsy or syndromes producing primary striatal degeneration the D2 dopamine receptor concentration is reduced. The latter are not responsive to dopaminergic therapy since the defect is on the "receiving end" of the dopaminergic transmission process. 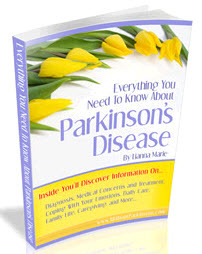 This could be quite useful since even in specialised centres Parkinson's disease and parkinsonian syndromes are confused in up to 20% of patients. Figure 7. Simplified dopaminergic synapse. 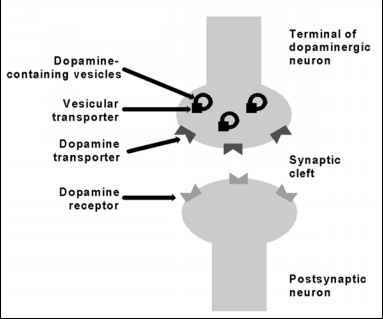 Dopamine (DA) is synthesized in the axon terminal, stored (via the vesicular transporter VMAT2) in secretory vesicles and released when an action potential depolarizes the terminal. Released DA diffuses toward the postsynaptic membrane where it can bind to a variety of DA receptors (5 subtypes have been cloned). DA can also bind to receptors on the presynaptic membrane (not illustrated), which modulate its synthesis and release. Some DA also diffuses out of the synapse and can act on non-synaptic DA receptors. Termination of DA action on receptors is brought about mostly by reputake into the axon terminal through the DA transporter for "repackaging" into secretory vesicles. Some DA undergoes enzymatic catabolism by MAO (intracellular) or COMT (synapse). Figure 8. Abnormal dopamine neurotransmission in (A) idiopathic Parkinson's disease and (B) primary striatal lesion causing parkinsonism. Note the comparative uptake of tracers that bind to the dopamine D2 receptor (123I-IBZM, left) and the dopamine transporter (123I-beta-CIT, right). Both disorders demonstrate reduced dopamine transporter function by the right basal ganglion (arrowhead). In idiopathic Parkinson's disease there is increased uptake of IBZM (arrow) due to a combination of decreased dopamine release and D2 receptor up-regulation reflecting normal neostratum with loss of dopaminergic (nigro-striatal) input. In contrast, with a primary striatal lesion there is slightly decreased IBZM uptake (arrow). independent of the pressure found within the ventriculo-subarachnoid space. Normally, CSF produced by the choroid plexi flows through the ventricular system to the fourth ventricle, where it exits the intracerebral spaces through the foramina of Luschka and Magendie. From there, some CSF descends into the perispinal sub-arachnoid spaces while the remainder enters the cisternae at the base of the brain and the cerebellum. Most of the CSF flows around and between the hemispheres, converging towards the superior sagittal sinus where it re-enters the circulation through arachnoidal invaginations into the lumen of the sinus (called Paccionian granulations). A small portion of the CSF is reabsorbed across the arachnoid into blood vessels along the neuraxis. Progression of the CSF along these different paths is ensured by a pressure gradient between the production and resorption sites, vascular pulsations, and intracranial and intraspinal pressure waves of multifactorial origin. The circulation of the CSF can be studied with nuclear cisternography in which an inert radiotracer (usually 99mTc- or mIn-DTPA) is injected into the lumbar subarachnoid space. Sequential scintigrams of the spine and head are obtained for 24-72 hours. A normal study shows rapid progression of radioactivity from the injection site towards the head, with intracranial activity noted anywhere between 1 and 3 hours post-administration. Activity progressively permeates all of the intracranial subarachnoid space without significant penetration into the ventricular system (though transient but minimal ventricular penetration is not unusual). By 24 hours, most of the activity should have been transferred to the superior sagittal sinus and excreted through the kidneys with most remaining intracranial activity superior to the cerebral convexities (Fig. 9). Since an increase in CSF pressure does not block its formation, CSF can accumulate intracranially with symptoms that vary depending on the speed at which the build-up occurs. For instance, malformations, hemorrhages or tumors in the posterior fossa can obstruct the egress of CSF from the ventricular system, giving rise to a condition known as non-communicating hydrocephalus (i.e., no communication between the ventricular system and subarachnoid space). More commonly, scinticisternography is performed for suspicion of communicating hydrocephalus. After such events as meningitis, subarachnoid hemorrhage or intracranial surgery, the subarachnoid space may become obstructed, impeding the normal flow of CSF. This situation can give rise to normal pressure hydrocephalus (NPH). The term NPH is a misnomer: by the time the disease comes to clinical attention spinal opening pressure may be normal because compensatory mechanisms have come into play to reduce intracranial pressure. Before this stage is reached, CSF pressure is probably periodically increased, resulting in ventricular dilatation. The "classic" clinical triad of NPH is dementia, gait disturbance and incontinence. The dementia is potentially reversible, and in a small number of carefully selected individuals there is a dramatic response to CSF shunting. Figure 9. Normal radionuclide cisternography. 111In-DTPA was injected into the lumbar subarachnoid space. Note initial activity within the extracerebral subarachnoid spaces and basal cisterns (arrowheads) which progresses to the Sylvian and interhemispheric fissures by 6 hours (arrows). By 24 hours resorption is almost complete. Normally the ventricular system is not visualized. that compensatory reabsorption is not well established and that deterioration is likely (Fig. 10). This may indicate a better response to ventriculo-peritoneal shunting than when only transient reflux is observed, since the latter suggests a stabilised condition with established, nonreversible damage to the periventricular brain tissue. In fact, no test (including scinticisternography) is particularly successful at predicting the response to surgery, emphasizing the importance of recognizing the "typical" clinical presentation. episodes of meningitis and requires surgical closure of the defect. Scinticisternography can confirm CSF leak by finding high levels of radioactivity in fluid draining from a craniofacial orifice (rhinorrhea or otorrhea). Identifying the anatomical origin often requires multiple projections and positioning of the head to increase the flow. differences in their distribution (for example, 99mTc-sestamibi normally shows intense pituitary and choroid plexus uptake). One established indication is in the differential diagnosis of infectious and neoplastic lesions in immunosupressed subjects with AIDS. Most neoplastic lesions will take up the agents listed above (Fig. 11), while most infectious causes such as toxoplasmosis will not (Fig. 12). The CT and MRI appearance of primary CNS lymphoma and toxoplasmosis can be indistinguishable, but therapy is radically different. 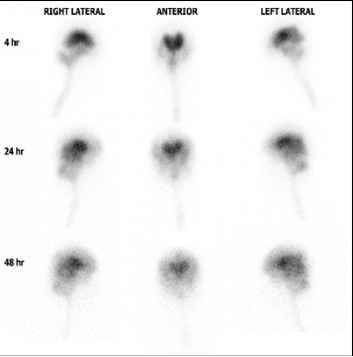 These radiopharmaceuticals can also distinguish radiation necrosis and tumour persistence or recurrence in areas shown to be abnormal by CT or MRI. Usually radiation necrosis shows little or no tracer uptake, though rare cases have been described with elevated uptake. 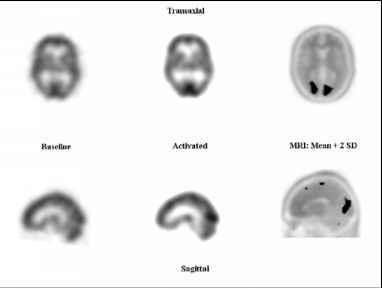 PET and SPECT imaging with 18F-FDG, thallium-201, 99mTc-sestamibi or 99mTc-tetrofosmin also seem to offer prognostic information on the behaviour of brain tumours Those with the highest uptake tend to have a higher grade and more aggressive behavior. Early imaging after the initiation of therapy has been reported to be a good predictor of the final therapeutic response, and PET/SPECT is superior to CT or MRI for this purpose. Figure 13. Ventriculo-peritoneal shuntogram. 99mTc-MAA was injected into the subcutaneous reservoir. Immeditae passage into the intracanial tube is observed with reflux of activity into the ventricles after pumping of the reservoir. No activity is seen in the efferent limb immediately inferior to the reservoir indicating distal obstruction at the level of the reservoir valve. with somatostatin receptors that do not disturb the BBB, such as low-grade gliomas. Tumours which are outside of the BBB, such as meningiomas, consistently concentrate the tracer. The full scope of nuclear medicine's role in the clinical evaluation of brain disorders is still evolving. Some applications have emerged as clearly useful, but others must be used in a prudent manner until there is additional documentation of their efficacy. Research in psychiatry, neurology and nuclear imaging should help us to characterise diseases affecting the human brain at their most fundamental, molecular level. 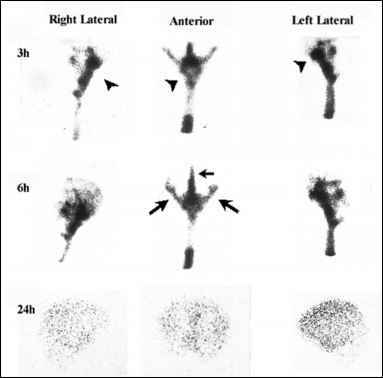 Nuclear medicine imaging techniques are uniquely suited to the in vivo, non invasive measurement of such parameters. Neuropsychiatric nuclear medicine is probably at the threshold of an explosion in its clinical use. A "shuntogram" is a nuclear medicine procedure used in patients who have previously had a ventriculo-peritoneal or venticulo-atrial shunt inserted. The tubing may become obstructed at different levels (intracranial segment, extracranial subcutaneous tubing, reservoir, reservoir exit valve, or subcutaneous tubing to the peritoneal cavity or left atrium). It is simple to inject radioactive tracer directly into the reservoir and then follow its migration. Depending upon shunt design, the reservoir may optionally be "pumped" to facilitate CSF movement. The pattern of CSF flow can be used to deduce the site of obstruction, if any (Fig. 13). How is a "brain death" study done and what is its accuracy? current definition of brain death describes the clinical state of totally absent central nervous system function in a hemodynamically stable, normothermic, nonintoxicated patient, which is followed inevitably by cardiovascular collapse. Diagnosis is based on coma, absent brain stem reflexes, and apnea (despite a documented pCO2 of > 60 mm Hg), with selective use of confirmatory testing. Under normal conditions, the presence of an electrocerebrally inactive EEG is a valid indicator of brain death. However, in some situations (such as in the presence of high doses of sedative/hypnotic medications), the EEG can be unreliable. 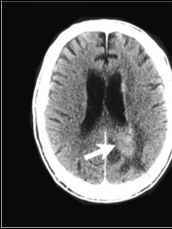 Complete cessation of cerebral perfusion as demonstrated by brain scintigraphy, transcranial Doppler sonography, or cerebral panangiography is also evidence of brain death. Contrast angiography is least desirable since it is invasive and the contrast exposure can threaten subsequent organ harvesting. 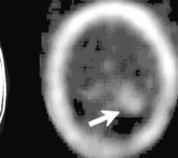 Numerous studies confirm the reliability of brain scintigraphy in the diagnosis of brain death. The great majority of patients (98.5% in one large series) judged to be brain dead by other criteria show absent brain blood flow ("empty skull") on "conventional" radionuclide angiography or rCBF imaging (Fig. 14). Even if an initial examination shows some preserved blood flow, a repeat study 72 hours later is usually diagnostic. There are no reported cases of neurological recovery following a definite scintigraphic diagnosis of brain death. Can rCBF studies be used in brain activation studies? Figure 15. Activation study. Baseline 99mTc-ECD SPECT scans were obtained at rest with eyes closed. The patient was then exposed to bright, colored, rapidly moving geometric shapes for 10 seconds prior to and for 3 minutes after a second injection of 99mTc-ECD. Statistical maps were obtained after spatially coregistering the studies, subtracting the baseline from the activation study and superimposing activated voxels (subtraction value more than 2 SD over the mean) on an MRI atlas. Note intense activation of calcarine visual cortex regions. neurology, psychiatry and psychology. Presently, fMRI, by virtue of its high temporal and spatial resolutions, is considered by many to be the tool of choice for such studies, and in large measure has displaced PET for this purpose. However, SPECT with either 99mTc-HMPAO or 99mTc-ECD, has an advantage over both of these methods: as these radiopharmaceuticals "capture" the distribution of cerebral blood flow at the time of injection and allow for delayed imaging, the patient can undergo complex activation protocols using instrumentation that either cannot be brought close to the powerful magnetic field of a fMRI scanner or that cannot be physically accommodated by PET or fMRI systems. In SPECT, the subject can be prepared with a simple intravenous line and then submitted to the activation protocols during which she/he is injected with the radiopharmaceutical at the moment of maximal stimulation of the structures involved in the task (Fig. 15). Later, after completion of other measurements, the patient can be brought to the imaging laboratory for the acquisition phase of the study. SPECT rCBF is the only non-invasive approach capable of this type of intervention. Is cistern an amino acid?